Colonial Courts of Admiralty Act 1890 Section 2 (1) and (2) and 3 (c) A Colonial Court of Admiralty shall not have Jurisdiction under this act to try or punish a person for an offence which according to law of England is punishable on Indictment. The Kings Privy Council under The Provisions of the Elizabethan Poor Law of 1601. The Vagabonds Act of 1530 (22 Henry VIII c.12) was an act passed under Henry VIII and is a part of the Tudor Poor Laws of England. In full, it was entitled an "Act how aged, poor and impotent Persons, compelled to live by Alms, shall be ordered; and how Vagabonds and Beggars shall be punished. The Documentary Evidence Act 1868 and the Controller for Her Majesty's Stationary Office to come forward to explain the legals behind a Registered Birth Certificate. Which in turn would bring in Wills Act 1837, Cestui Que Vie Acts of 1666 and 1707. Ministry of Justice are corporation they are bound by Companies act 2006 which brings them under The Law Commission the execution of Deeds and Documents by or on behalf of Bodies Corporate, companies act 2006, misrepresentation act 1967,conflict of interest, HMCTS is a corporation and the Ministry of Justice is a corporation Dun & bradstreet number : 225498526 and also has CCJs against them : Case number:3YJ68358,2YL84427,3YK14710,C85YJ706,C20YP105,D43YJ740,D41YJ471,D60YJ339,B86YM006,D63YJ693 AND E05YX187. Full Disclosure and Validate the contract signed by both parties and therefore binding both parties under Company law, Corporate law and Unidroit. Full Disclosure and Validate the true and certified copy (NOT photocopy) of the Original Note (Credit Agreement), under penalty of perjury and with unlimited liability and confirm that this Note, has never been sold. Please also confirm the name of the individual who is the duly authorised representative from your company, who has carried out due diligence under The Money Laundering Regulations 2007 and what actions she/he has taken in relation to this account. The word Person on your letters or in court under the Interpretation Act 1978, the British Nationality Act 1948, Person " includes a body of persons corporate or unincorporated. The definition of "person ", so far as it includes bodies corporate, applies to any provision of an Act whenever passed relating to an offence punishable on indictment or on summary conviction. I would further advice that I do not give my consent and decline the offer to hearings conducted in a Court de facto and insist that this matter be dealt with in a Court de jure under common law and under the Constitutional Reform Act 2005 rule of law. 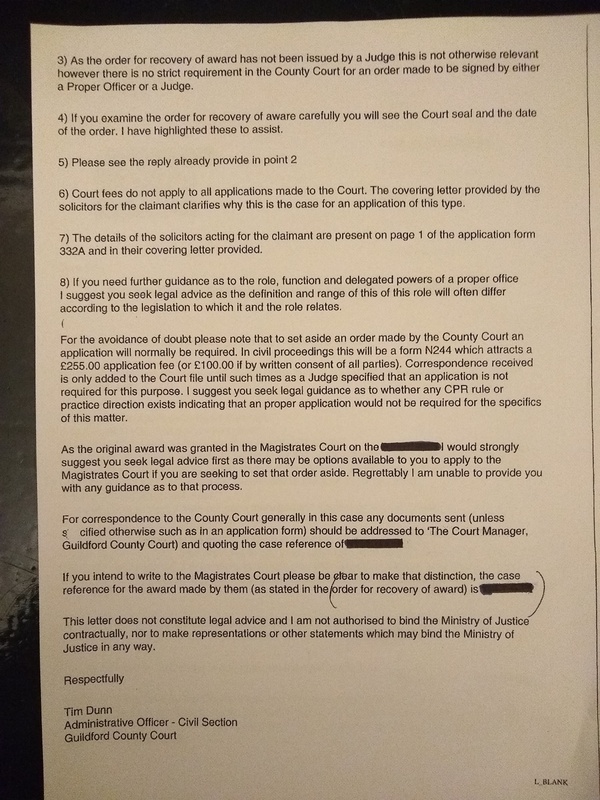 I would further advice that the xxxxxxxxx Council legal team should be fully aware of the status of xxxxxxxxxx Magistrates' Court as being a branch of the Ministry of Justice which is a registered corporation, and as such conducts its business under admiralty Jurisdiction under the Colonial Courts of Admiralty Act 1890 whose rulings are invalid on dry land without the consent of both parties to the hearing, and that I specifically do not consent to these proceeding under this Jurisdiction. The following will be used for a Emergency Judicial Review under Pubic Interest and Case Law and 'Declaration of unconstitutionality', Due to a failing of Due process ,Duty of care and a Tort of Misfeasance by all involved . Under the doctrine as it exists today, two delimited requirements determine whether judges may incur civil liability. First, judges may be subject to civil liability when they perform a non-judicial act.' Second, judges may be subject to civil liability for any act performed in complete absence of jurisdiction. To decide whether an act is judicial, courts look to "the nature of the act itself. Quasi Delict is a French legal term used in some civil law jurisdictions. It refers to a negligent act or omission which causes harm or damage to the person or property of another, and thus exposes a person to civil liability as if the act or omission was intentional. In short, by means of these Writs or Orders the courts perform the value and essential functions of interpreting the limits of the power of the administrative authorities and issuing Writ or Orders to prevent and authority from exceeding it's powers. I hereby give notice of motion I wish to appeal on a point of law of exceptional constitutional importance where the matter involves a matter of general public importance and it is in the interest of justice requires it where there are 'exceptional circumstances' warranting a direct appeal, to the Supreme Court of Judicature 1873 Vict 36 & 37 c.66 in accordance with the Administration of Justice (Miscellaneous Provision) Act 1934. Sovereignty is defined as Supreme unfettered and unlimited power. God gave man Dominion of Earth. Genesis 1:26 And God said let us make man in our image after our likeness and let them have dominion over the fish of the sea and over the fowl of the air and over the cattle and over all the Earth. My God enables me to have the all seeing eye off truth and simple heart, under oath to please God to do good to my fellow man and woman and all creatures of all life, and swore under oath and testify my gratitude to my Divine Creator God. Having seen and heard all of this, you may choose to look the other way but you can never again say that you did not know which is a Tort of Misfeasance. Apostolic Letter Issued MOTU PROPRIO of The Supreme Pontiff Francis 1 September 2013.On The Jurisdiction of Judicial Authorities of Vatican City State in Criminal Matters. Unam Sanctam 18 November 1302,Boniface, Bishop, Servant of the servants of God. 1: Full Disclosure of the what Jurisdiction the Council and Magistrates are enforcing Council Tax To the Civil and Criminal Procedure Rules . 4: Full Disclosure of the Government Order that never passed through Parliament in 1971/72 that gives the council the authority to issue multi claims for liability orders that are not printed or signed under the Civil Procedure Rules 1998 as of 2012.
according to the law of England is punishable on indictment. Full Disclosure and Validate why HMCTS is a corporation and the Ministry of Justice is a corporation Dun & bradstreet number : 225498526 and also has CCJs against them : Case number : 3YJ68358, 2YL84427,3YK14710,C85YJ706,C20YP105,D43YJ740,D41YJ471,D60YJ339,B86YM006,D63YJ693 AND E05YX187 So produce the written signed contract between HMCTS and Ministry of Justice and the Stockport Council and myself . which brings them under The Law Commission the execution of Deeds and Documents by or on behalf of Bodies Corporate, companies act 2006, misrepresentation act 1967,conflict of interest. All digital or hard copy information held with my details i.e. Gary and Stafford and Account Number : 5000988080 any other relevant unique information relating to me personally. After the Reformation and the establishment of the Church of England, many of the old values and moral expectations disappeared so it became necessary to regulate the relief of poverty by law. During the reign of Elizabeth I, a spate of legislation was passed to deal with the increasing problem of raising and administering poor relief. those who would work but could not: these were the able-bodied or deserving poor. They were to be given help either through outdoor relief or by being given work in return for a wage. those who could work but would not: these were the idle poor. They were to be whipped through the streets, publicly, until they learned the error of their ways. those who were too old/ill/young to work: these were the impotent or deserving poor. They were to be looked after in almshouses, hospitals, orphanages or poor houses. Orphans and children of the poor were to be given a trade apprenticeship so that they would have a trade to pursue when they grew up. The law required each parish to elect two Overseers of the Poor every Easter: those who were elected were unpaid and often were unwilling appointees who acted under the supervision of the JPs. However, the means of poor relief did provide a way of controlling the 'lower orders' and reinforced a sense of social hierarchy. The Elizabethan Poor Law were appropriate for the society of the time. Outdoor relief: the poor would be left in their own homes and would be given either a 'dole' of money on which to live or be given relief in kind - clothes and food for example. This was the norm. Part of the 1601 Law said that poor parents and children were responsible for each other, so elderly parents were expected to live with their children for example. However, everyone in need was looked after at the expense of the parish, which was the basic unit of poor law administration. There were 15,000 parishes throughout England and Wales, each based on a parish church. However, no mechanism was introduced to enforce any of the measures stated by the 1601 Act and the operation of the poor law was inconsistent. The legislation did not set down any administrative standards so parishes were at liberty to interpret the law in any way they wished. There were great differences between parishes which varied between extreme laxity and extreme stringency in the interpretation of the law. Some towns, such as Bristol, Exeter and Liverpool, obtained local by-laws that established corporations of the poor: their responsibilities extended over several of the urban parishes within their jurisdiction. The first adaptation of the 1601 Act came in 1607 and provided for the setting up of Houses of Correction in each county. Here, work was provided for the unemployed at local rates of pay; work could be forced on the idle and on vagabonds. The Houses of Correction were not part of the Elizabethan system of poor relief and were totally separate from the parish poor houses because the law made a clear separation between the settled and 'wandering' poor. The 1601 Elizabethan Poor Law continued with further adaptations — for example the 1662 Settlement Act, Gilbert's Act (1782) and the Speenhamland system of 1795 — until the passing of the 1834 Poor Law Amendment Act and formed the basis of poor relief throughout the country for over two centuries. It was a fair and equitable system run for and administered by local people at a time when the population was small enough for everyone to know everyone else and his/her circumstances. This meant that the idle poor were known as such and would be given short shrift at the hands of the Overseers of the poor. One of the later complaints about the 1601 Act was that the basis of the law was that it rated land and buildings but not personal or movable wealth. Consequently it benefited the industrial and commercial groups in society who did not fall within the parameters of the legislation and so did not pay into the poor rates unless they also happened to own landed property. without my consent and without lawful excuse, £100,000 per violation per officer or West Yorkshire police employee and or their agent, excluding costs to repair damages to my home, which will be invoiced to you later. My self being strip searched and humiliated against my consent £25,000 per violation for myself to endure any court cases due to West Yorkshire Police officer’s or their employee’s and or their agent’s misconduct £1,000,000 per day in court. Thank you for your business. These terms and conditions may be adjusted without warning and the terms may be added to in the future. 17th Nov 2018 Without prejudice and with all Natural and inalienable rights reserved. Under the reasoning of Thoburn, outright amendment or repeal of the Human Rights Act itself, for example, would require that Parliament unambiguously do so in order to restrict or “dis-incorporate” convention rights. Even in that event, the Magna Carta, Bill of Rights 1689, and Great Reform Bill constitutionally establish basic rights principles such as habeas corpus, a right to petition, and a right to vote. Constitutional statutes in this way insinuate themselves into the common law, with both mutually informing and reinforcing each other.86 Through their normative force, the principles enshrined in these special statutes have a value beyond their explicit text, elevating them above ordinary statutes and setting them in a substantive rule-of-law framework that restrains government power independently of the HRA. government power for the same ends, by promoting some degree of regional equality, identity, or decision-making autonomy for the U.K.’s constituent national communities. Section 2(1) of the 1911 Act, however, expressly made one notable exception on the use of its procedures, excluding from these any bill extending the life of Parliament beyond five years. Although unnecessary for deciding the case before them, some Lords of Appeal speculated on the hypothetical issue of whether or not the House of Commons could use the Parliament Act 1949 to amend section 2(1) of the 1911 Act, so as to permit the Commons to extend the life of Parliament beyond five years without the consent of the House of Lords. Lord Bingham expressed an opinion that the House of Commons, in this way, could indirectly achieve what it could not directly legislate under the unamended 1911 Act.89 Lord Nicholls disagreed, however, arguing that section 2(1) necessarily implied that the House of Commons could not indirectly extend the life of Parliament by first amending section 2(1),90 leading to a conclusion that any bill purporting to do so by this two-step procedure could not be an act of Parliament and would, therefore, be legally invalid. Most interesting, however, was the decision of Lord Steyn. He agreed with Lord Bingham that the House of Commons could use the procedures of the two Parliament acts to amend section 2(1) of the 1911 Act so as to permit the Commons to extend the life of Parliament without consent of the House of Lords. However, he explored the constitutional implications of such unicameral authority in the House of Commons. Under this interpretation of section 2(1), “the 1949 Act could also be used to introduce oppressive and wholly undemocratic legislation.”91 Although the supremacy of Parliament remained the “general principle” [italics original] of the constitution, it was not absolute. Lord Steyn mused: “In exceptional circumstances involving an attempt to abolish judicial review or the ordinary role of the courts, the Appellate Committee of the House of Lords or a New Supreme Court may have to consider whether this is a constitutional fundamental which even a sovereign Parliament acting at the behest of a complaisant House of Commons cannot abolish.”92 Lord Steyn's warning raised doubts about the orthodox doctrine of parliamentary sovereignty and the constitutional responsibility of the courts to enforce a statute, should a government introduce legislation manifestly at odds with liberal democracy.93 While one might not wish to speculate about or doubt the doctrine of parliamentary sovereignty, as did some of the Lords in Jackson, the case, nonetheless, reveals the special status that some statutes have in constructing the rule-of-law framework within which Parliament legitimately exercises its power. Accordingly, should Parliament expressly amend or repeal a constitutional statute, as it did previously in suspending the Northern Ireland Act 1998 following the impending breakdown of the Good Friday Agreement,103 the courts would then have to determine whether the interference so undermined the statute's underlying principles that it would justify a declaration. The Northern Irish situation, for instance, suggests the delicate political issues that courts would confront in deciding not just what alterations to constitutional statutes are serious or minor but also whether they are consistent with the statutes’ principles. For example, the U.K. Parliament took the extreme step of authorizing the suspension of devolved government under the Northern Ireland Act 1998, doing so in order to salvage the peace process and ensure stable, peaceful self-government in the region for the long term. From this perspective, the suspension of Northern Irish government arguably would have been constitutional in the sense of being consistent with the principles of devolution, although the Northern Ireland Act itself (for various reasons) might not have “constitutionally embedded” itself as quickly or as firmly as, say, the Scotland Act seems to have done. The point is, faced with Parliament's express amendment or repeal of any of the terms of a constitutional statute, a court will be faced with two choices with regard to making a declaration. First, a judge must cautiously distinguish the constitutional from the unconstitutional alteration of a fundamental statute, looking beyond strictly textual alterations to overarching constitutional principles and the legislative purposes motivating the amendments in question. This assessment will require a teleological approach to constitutional adjudication. Taking again the example of the suspension of the Northern Irish government, Parliament's actions might arguably have been constitutional regarding the devolution project as a whole, especially given that devolution was itself in an early, somewhat experimental stage.104 Furthermore, legislative changes to fundamental statutes might also be consistent with emerging constitutional norms, valuably amending “out-of-date” ones.105 Just what standards a judge would apply in distinguishing constitutional from unconstitutional alterations of fundamental statutes—and in deciding whether a declaration would be appropriate in the latter case—will require further elaboration by the courts. For now, however, it may be said that where Parliament has expressly and seriously contravened not only the terms but the spirit of a constitutional statute in an unjustifiable, disproportionate, or wanton way, courts can legitimately consider declaring the interfering law to be unconstitutional, leaving it for Parliament and the public to consider the ramifications of the offending actions. The second approach toward declaring some infringement of a fundamental statute unconstitutional is strictly and more simply rooted in the text. That is, if Parliament expressly amends or repeals a fundamental text in any way, a court could consider making a declaration of unconstitutionality, highlighting the inconsistency of the resultant law with the special statute and then leaving it for parliamentary reconsideration through the political processes. With this second approach, a declaration of unconstitutionality would flow more directly from an interpretive conflict between contradictory, new legislation and the existing constitutional text, just as it would with the infringement of common law rights or conventions. Unlike with those rights or conventions, however, the hard text of fundamental statutes leaves less room for flexible judicial interpretation of the constitutional norms involved, or for their reconciliation with potentially conflicting, subsequent legislation. This could make a strict approach to judging a conflict between new legislation and a fundamental statute, perhaps, undesirable. The lack of flexibility might also make it more problematic for judges who, on wider principles, might be indisposed to declare the changes in question to be unconstitutional, especially as otherwise there would be no “amending procedure” by which the permanent alteration of a written constitutional norm could be achieved. The above questions notwithstanding, Britain's new constitutional jurisprudence has now developed in a way that logically points toward a declaration of unconstitutionality based upon special textual provisions. Discerning the standards to be applied in distinguishing a constitutional from an unconstitutional breach is the next step on the path of legal development already chosen by the courts. While courts have long recognized certain documents to have special constitutional significance for purposes of statutory interpretation, the decision in Thoburn settled the fact that courts will now require Parliament to amend or repeal constitutional statutes by express language only. The interpretive approach toward these statutes is, therefore, the same as that taken toward common law rights and conventions. Whether protecting individual rights directly or indirectly through the establishment of institutional structures and respect for regionalism, constitutional statutes establish the norms by which courts must assume Parliament exercises its supreme legislative power. Thus, “[i]t is possible to achieve the same practical effect as entrenchment whilst preserving continuing parliamentary legislative supremacy.”106 Where a court finds that Parliament does clearly wish to amend or repeal a fundamental statute—at least in a material way that offends that statute's transcendent principles—the interpretive process points toward a conclusion that Parliament has legislated in an unconstitutional way. This, in turn, leads to and justifies a nonbinding declaration to that effect. Is a Constitutional remedy foreclosed? Until the Human Rights Act, no court had ever declared formally, as a remedy, that an act of Parliament violated individual rights. Of course, one might say that courts, once, were less protective of fundamental rights, more deferential to the political branches, and made little distinction between constitutional law and statutory law than is now the case.107 Breaking with this more radical formalistic tradition, judicial recognition of substantive, higher-order values has risen in the past decades, along with a more assertive view of the judiciary in guarding the rule of law. It is noteworthy, nevertheless, that no British court has ever explicitly disavowed the power to grant a declaration that Parliament has violated constitutional principles. That said, some pre-HRA challenges to government action did seek declaratory relief, potentially raising this kind of constitutional conflict. In Malone v. Metropolitan Police Commissioner108 and R. v. Secretary of State for the Home Department, ex parte Brind,109 courts refused to issue declarations that the Crown had violated convention or common law rights unlawfully; this was under circumstances where doubt might have arisen about the compatibility of the statute with fundamental rights. These two cases are often cited as showing the lack of rights protection before the HRA, as well as the unavailability of a judicial remedy for rights infringements.110 These cases, then, have the greatest potential for undermining the argument that courts have the authority to make a declaration of unconstitutionality against Parliament. A reexamination of these cases, however, shows that they did not categorically reject a declaratory power in situations where a government infringes basic rights but only denied the higher status of the particular rights at issue. Malone and Brind, despite refusing to declare that the Crown had infringed any fundamental rights, actually left open the possibility that such declarations might issue against either it or Parliament under appropriate circumstances. unlawful.114Moreover, Malone concerned wiretapping ordered by the executive and done without (but not contrary to) either common law or statutory authority; in the absence of any prohibitions against it, the tapping was lawful.115Malone, therefore, did not even address the issue of whether a declaration would be inappropriate or impossible as a remedy, where an act of Parliament itself violated a fundamental common law right. The closest Sir Robert came to analyzing the idea of a fundamental right was to reiterate that the court's declaratory power was “confined to making declarations on matters that are justiciable in the courts.”116 However, there existed no plausible domestic rights in the case—either under common law or the convention, and thus the situation failed to present a justiciable controversy. Accordingly, Malone left open the possibility that, in other circumstances, a court might indeed consider declaratory relief, where a statute and some constitutional right could not be reconciled. Brind also concerned a request for a declaration that the Crown had violated an individual's fundamental rights; the request was made under the unincorporated convention alone, without any appeal to common law. Like Malone, Brind did not reject outright the idea of constitutional rights and did not categorically preclude a court's making the kind of declaration sought by the claimant. In Brind, the home secretary exercised a statutory power to order that the BBC and Independent Broadcasting Authority refrain from broadcasting any matter spoken by persons representing proscribed terrorist organizations. 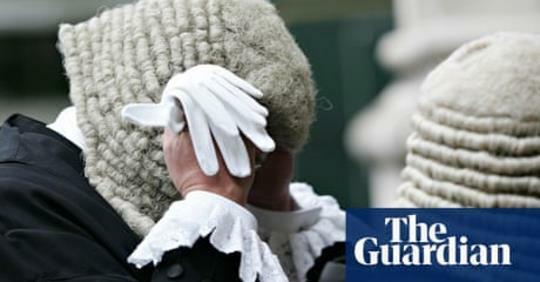 The applicants claimed that this order was ultra vires by arguing that the home secretary had a legal duty to comply with section 10 of the convention, to be imputed into the primary legislation under which the order was made. The House of Lords rejected that argument. While Lord Donaldson recognized the similarities between many common law and convention rights, he noticed that “in this case we are invited to grapple with the fundamental question of the effect of the Convention as distinct from any common law to the like effect.”117Brind rested upon the status of convention rights only and did not address the apparent conflict between the authorizing statute itself and rights at common law. Like the Chancery court in Malone, the House of Lords found that the convention was a legally unenforceable treaty. The Lords admitted that English courts would consider the convention when construing ambiguous statutory language but dismissed its relevance where the statute's meaning was clear.118 In Brind, however, Parliament's intent was quite apparent and to find an implied intention that the executive must comply with the convention would be to incorporate the treaty “by the back door. Malone and Brind, as the two most prominent pre-HRA cases where declarations based on fundamental rights were sought and refused, never actually dealt with a conflict between Parliament and a higher-order principle. Instead, both cases left open the possibility of such a conflict, as well as of declaratory relief in that event. If one objects that there is no direct precedent for a declaration against Parliament, neither is there any against it. Therefore, any reading of these cases as foreclosing a declaration of unconstitutionality as a constitutional remedy is too broad. Such a broad reading would, furthermore, be at odds with the new constitutional jurisprudence and the courts’ interpretive process—both of which now clearly point toward a declaration where higher-order principles and a statute are irreconcilable. In the years since the Human Rights Act came into force, courts have for the first time directly and substantively reviewed acts of Parliament against fundamental rights, incorporated in the form of the European Convention on Human Rights. Where Parliament violates those rights, the HRA allows courts to make nonbinding declarations of incompatibility; ideally, this will increase Parliament's political accountability for respecting human rights. However, the declaration made in cases such as A and Others (No. 1) and other decisions under the HRA have incited criticisms of both judges and of the act itself, prompting not-so-veiled threats that future amendment of the HRA is not a political impossibility. It is perhaps not too outrageous to fear that, one day sooner or later, Parliament might amend or even repeal the Human Rights Act so as to “dis-incorporate” convention rights. This article has argued, however, that such an unfortunate development would not extinguish the judicial power to declare acts of Parliament incompatible with constitutional norms, such as common law rights. Indeed, this constitutional remedy would be available even with the HRA in place; indeed, common law rights might offer greater protection than the ECHR, even as indigenous legal conventions and fundamental statutes can promote the systemic mechanisms of democratic government. Such a declaratory power resides in the courts by virtue of the interpretive process by which they apply a constitutional jurisprudence that exists and evolves independently from the HRA These multiple sources of higher-order law, subject only to express amendment or repeal, establish principles within a substantive rule-of-law framework that both constrains legislative power and gives legitimacy to the doctrine of parliamentary sovereignty. Courts, therefore, will not lightly find statutory conflict with these constitutional principles and will require that Parliament make a contrary intent unmistakably clear. Where a court finds that Parliament has indeed exercised its sovereign power against these principles, it will also, and necessarily, conclude that Parliament has acted unconstitutionally. The logical extension of this interpretive process is that courts can formally issue a declaration of unconstitutionality in the event of a constitutional conflict. No precedent precludes this constitutional remedy, nor would it undermine the doctrine of parliamentary sovereignty. Such a declaration, like its statutory counterpart under section 4 of the Human Rights Act, would be nonbinding and not affect the legal validity of a statute. A declaration of unconstitutionality would instead complement parliamentary sovereignty, within the liberal democratic context, by enhancing government's political awareness of its constitutional obligations and its accountability to the electorate. Resolution of the constitutional conflict, then, would be appropriately left to the democratic political process. With its sovereignty intact, the only objection Parliament could have to a declaration would be the desire to exercise its legislative power free from open and full accountability in the courts for violations of its constitutional obligations. And any attempt by Parliament to forbid a declaration—should a judge first be brave enough to take this important next step of constitutional jurisprudence—would be, no doubt, unconstitutional. High Treason Laws Against Establishing a Foreign Power In England. It is the function of the Attorney General to advise governments and government departments (see Whitaker’s Almanac). Succeeding Attorneys General have failed to advise governments of the implications of the contents of Magna Carta, the Petition of Rights, the Bill of Rights and Habeas Corpus. This is a dereliction of duty. Another attempt to establish an Imperium in Imperio by aliens, a felony of Praemunire, was reported in the Daily Telegraph of 15th July 1990. It was stated that the Muslim leader Kalim Siddiqui called for a special relationship between Muslims here and the government of Iran. He launched a manifesto to politicize Britain’s Muslim community which aimed to establish an Islamic parliament, to persuade Muslims to discriminate in favour of other Muslims, to place the names of all Muslims in Britain on a computer database and to raise five million pounds to establish a Muslim parliament in Britain. To do this is to commit the felony of Praemunire punishable with death by hanging. The culprits are those subjects of the Crown who have allowed this situation to arise. It is up to the government to give all Muslims their marching orders out of this country or incur the penalties laid down for Praemunire, allowing aliens to establish an Imperium in Imperio. The so-called Race Relations Acts are conspiracies to use acts of parliament to enforce the racial integration of subjects of the Crown with Negroes and Asiatics especially brought here for the purpose. They are acts of racial hatred against us by prohibited immigrants. The Race Relations Act of 1965 was introduced to parliament by the Russian Jew Frank Soskice, purported Labour Attorney General. Further Race Relations Acts were devised by the Board of Jewish Deputies. The Jewish Chroniclestated that amendments must be made to the Race Relations Act since the 1965 Race Relations Act was not working the way they wanted it to. The 1976 Race Relations Act was passed in the Commons by default, with only 132 of the 635 members present; 124 Labour and Liberal traitors voted for the bill with eight Tories against. The Edict of Expulsion was an act of Edward I which expelled all Jews from the kingdom of England. To understand why why Edward acted in this way, you have to go back in history. Biblical exhortations against the lending of money led to an attitude among the inhabitants of Christian Europe that the lending of money at interest was at best, un-Christian, and at worst, sinful and evil. The Jewish religion attached no such stigma to lending money, and as a result many Jews offered that service to Christians. In the years following the Conquest of 1066 the Jews were an important part of Norman English society. The nobility of England were constantly in need of money, and as a result, they borrowed heavily from Jewish moneylenders. William the Conqueror recognized the importance of the Jewish moneylenders to Norman society, and offered them special protection under law. Jews were declared to be direct subjects of the king, not subjects of their local feudal lord. Because of this special status, however, English kings saw the Jewish moneylenders as a convenient source of funds. The king could levy taxes against Jews without needing the prior approval of Parliament. So when a king needed money - as they often did - he could simply levy a special tax on the Jews. This system would work as long as the Jews were allowed to accumulate money, but that was about to change. Throughout the period following the Norman invasion the medieval world underwent a gradual shift towards religious heterodoxy (emphasis on a single belief system), epitomized by the Fourth Lateran Council of 1215. The Lateran, among other measures, required Jews and Muslims to wear special dress so that they could easily be distinguished from Christians. England enforced this proclamation by requiring Jews to wear a special badge. Church proclamations like those of the Fourth Lateran Council really gave official approval to attitudes that were already prevalent in medieval society. The large landowners resented their indebtedness to the moneylenders. Attitudes of religious persecution became more and more evident. Even before the Lateran Council, outbreaks of mob violence aimed at Jews was not uncommon in England, for example, in 1190 a mob killed hundreds of Jews in York. At the same time as attitudes of intolerance were becoming more common - and more acceptable to both the Church and the state - the emergence of the Italian system of merchant banking made the Jewish moneylenders less vital to the nobility. Measures of punitive taxation against the Jews became more common, with the result that there were fewer Jewish moneylenders with ready cash to lend. In 1285 the Statute of Jewry banned all usury, even by Jews, and gave Jews 15 years to end their practice. Unfortunately, given prevailing altitudes towards Jews in trade, few avenues of livelihood were open to those affected by the Statute. These matters came to a head in 1287 when Edward I peremptorily seized all Jewish property and transferred all debts to his name. In other words, everyone who had previously owed money to a Jewish moneylender now owed it directly to Edward himself. On 18 July, 1290, Edward I issued what came to be called the Edict of Expulsion. The same day that the Edict was proclaimed writs were sent to the sheriifs of most counties advising that all Jews in their counties had until 1 November to leave the realm. Any Jews remaining after this date were liable to be seized and executed. To rub salt into the wound a special tax on the Jews was agreed in Parliament. How many people were affected by the Edict of Expulsion? Records are inexact for this period, but it seems likely that about 3000 Jews were forced to leave England. Edward's Edict to banish the Jews was followed by his fellow Christian monarch in France, Philip le Bel, sixteen years later. It was not until 1656 that Jews were allowed back into England. In the intervening period Jews were required to obtain a special license to visit the realm, though it seems very likely that some Jews resettled in England while keeping their religion secret. If you deside to put in your own claim against corporations/ companies , In the Common Law of the Land you would take your evidence to your local police ,who then would investagate your claim and put it in front of the CPS. The Companies use the CPR Rules Part 7 against you the Man Or Woman. So if you deside to go down this route make sure you understand the CPR Rules Part 8 inside out . ​So Drop your fear and become the claimant , They use your fear to win , take back your Divine rights under God. 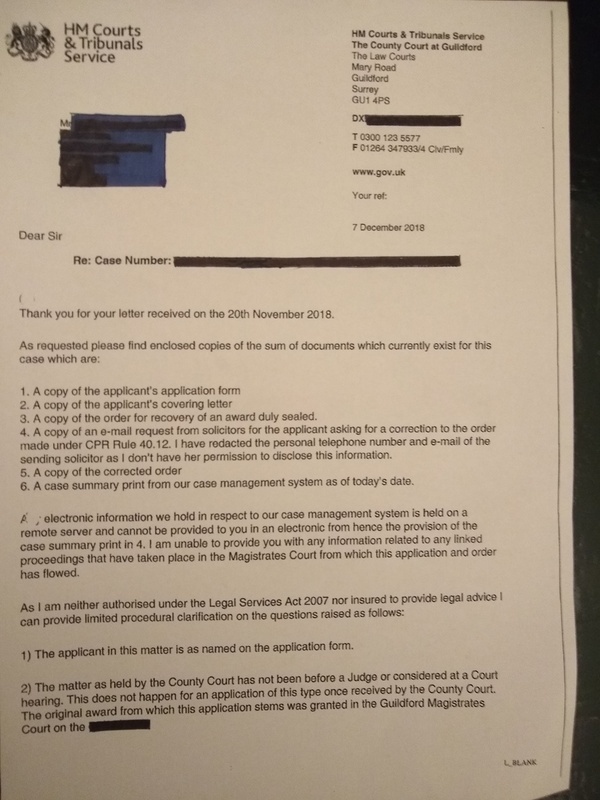 So the Royal Courts of Justice at the Admin will try and get you to not to file your documents , telling you it is in the wrong jurisdiction, it is not , but they will try , So this is when you need to stand up and get it filed . N227: A Judge Will Be Deciding On Damages. So here is your remedy , be very careful if you are going to do this , but the more that put these into Court the quicker things will change , you can use this as a SAR Request ( the words ), Have fun and enjoy 2019 , this is for ever man and woman in every country , everything is under english words /latin.